It seems everywhere you look, there are books, TV shows, and more looking at everything from hoarding to just plain clutter. One of the names popping up increasingly is that of Marie Kondo, the Japanese organization guru who has gained popularity through her book, The Life-Changing Magic of Tidying Up, and now her Netflix TV series, Tidying Up. While some of her methods may be unusual, people across the country, including your neighbors in homes in Savage MN, are trying some of her approaches to lead a less cluttered life. The principle tenet of Kondo’s Konmari method of organization is to only keep things that spark joy in your life. Obviously, some things that don’t spark joy will still need to be kept — vacuum, toilet brush, etc. — you should apply it to the things that take up the most space in your home. Clothing, paper, toys, books, movies, towels, sheets and more all need to be carefully considered. Kondo typically has people start with clothing. Take out everything from your closets and chests of drawers and go through each piece individually, only keeping those pieces you truly like and wear. If they don’t spark joy in you, sort them into piles for donation and tossing. Once you’ve been honest with yourself, you should have a significantly smaller pile of clothing. Kondo believes a typical closet should have enough room for two people’s clothing. 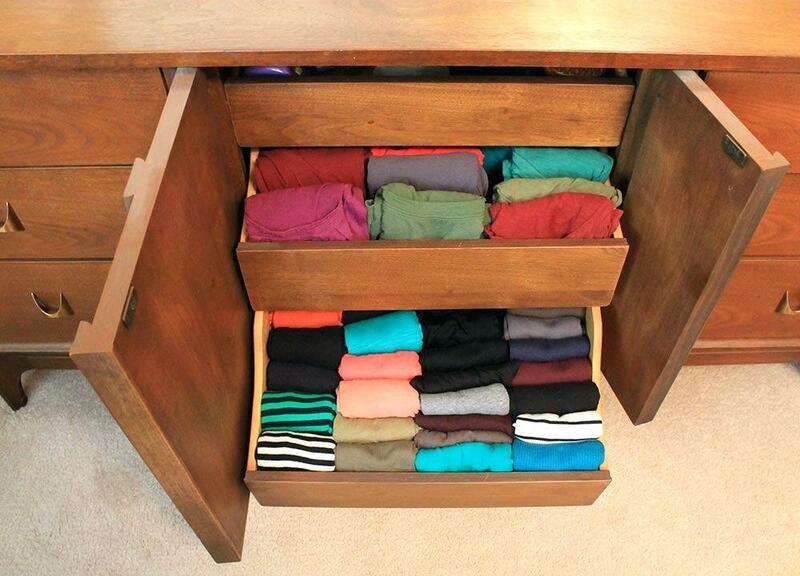 With proper organization within the closets and a folded and upright, vertical method of storing clothing in drawers, all of your clothing should be more accessible and easier to keep neat. In today’s digital age, Kondo also suggest getting rid of most of the paper we often hang onto in our home offices and other areas. Except for important legal documents, try to get rid of any paper you truly don’t need. If there are documents and items you want to keep but don’t need the physical document, scan it and save it digitally. This goes for children’s artwork that you’ve probably kept, too. Be honest and save only the ones that truly stand out and have strong memories and associations. Storage areas, whether closets, bathroom cabinets, kitchen cabinets, pantries, or front entry cabinets and closets should still be organized, even if the contents are hidden behind closed doors. Using smaller containers to group similar small items together is a useful way to keep items organized. Use small boxes, drawer dividers and similar items to keep items easily accessible. The Konmari method does take self-discipline and a strong will, particularly when it comes to getting rid of items that may seem in perfectly good condition. But if you’re honest with yourself, getting rid of items that you just don’t use or even notice — because they don’t spark joy in you — ultimately leads to a less cluttered life. If you can keep items organized and, preferably out of sight, the clean surfaces around you will help encourage you to maintain this sense of order, which not only makes your homes in Savage MN look better, you’ll likely feel better without all of the clutter that can create stress.